Domino Marquees have been setting the standards in marquee hire in Essex, London, Hertfordshire and the South East since 1989. We are a family run business who provide high quality marquees to individuals, companies and organisations for all occasions including weddings, bar-mitzvahs, anniversaries, birthdays, proms, charity functions and all other special events. We have built a strong reputation for the quality workmanship and personal service that comes with a family run business. For some examples of the level of marquees which we provide please have a look at our Gallery page or visit our Facebook page for even more photographs. In the past we have worked with local government and the NHS as well as commercial enterprises and voluntary organisations such as the Football Association, H&M, Sainsbury's, Inland Waterways, The Scout Association, East Finchley Reform Synagogue, and The London Chest Hospital. Accident Repair center in Hornchurch , Essex . Looking for a reliable , friendly and reasonably priced bodyshop ? Then look no further ! Since 2010 we have been providing customers with just that , from classic car restoration , complete resprays , and small bumper scuffs no job is too big or too small, all are completed to the highest standard and returned to the customer looking as if nothing had happened at all . We will provide you with with a free estimate at home , your place of work or you can come to us . Emerson Park Electrical started in year 2015 as Private Limited Company with registration number 09484058. 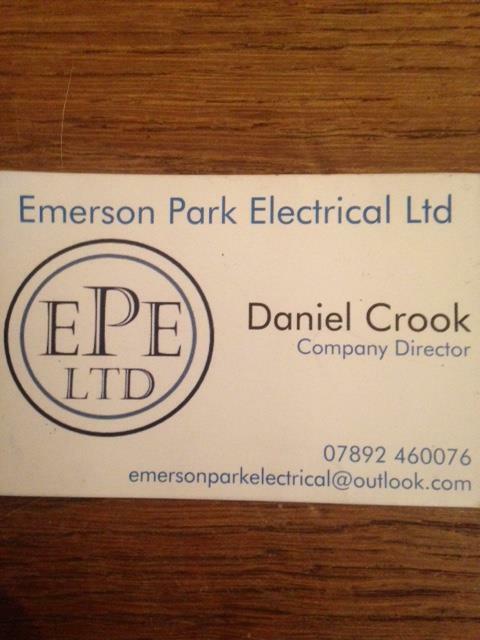 The Emerson Park Electrical company has been functioning successfully for one year now and its status is active. The firm's office is based in Hornchurch at 11 The Woodfines. Postal code: RM11 3HR.